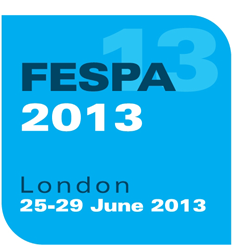 FESPA 2013 is the largest focused event for the wide format print industry; encompassing the very latest equipment and consumables in digital printing, screen printing, industrial and garment decoration to be held from the 25th-29th of June 2013 at the award winning ExCel London Exhibition Centre. Eve Products will be exhibiting under the umbrella of the DISQ Group on stand P7S at the event. TheGroup is to showcase new products and launch new services to support the large format printing marketplace. Visitors to the stand will be able to view the latest products including the next generation of iPad display systems, a new range of linkable banner systems, the launch of a dedicated trade modular exhibition service and the latest portable products for retail promotional use. In September of 2012 that DISQ Group agreed terms to expand its membership to include Alfa Display, one of the UK’s leading suppliers of modular exhibition solutions to the trade. Prior to this the DISQ Group currently comprises of three businesses, Eurostand Display, one of the UK’s leading manufacturers and distributors of indoor and outdoor display products, Promotor Industries International the world’s leading manufacturers of promotional units for the retail sector and Eve Products the UK’s leading display product innovations company and creator of Twist. Luke Facey said I am so pleased to have joined the DISQ Group I believe that Alfa’s inclusion will bring benefits to the DISQ Group and Alfa Display but most importantly to our clients as well. We all have the ambition to provide the very best trade service to our customers and if we do that better than our competition and in an honest and ethical way we will be successful together. We were already very excited about being a founder member of DISQ an initiative that saw us joining forces with specially-selected partners both to benefit our existing clients and significantly broaden the markets into which we are all expanding. But nothing could have prepared us for the reaction DISQ was to receive as one of the larger exhibitors at Sign & Digital UK Britain’s premier annual UK graphics industry showcase, held in March. We were frankly overwhelmed; not only by the support we received from our customers, contacts and the trade media, but from many new prospects all genuinely interested in hearing more about our value proposition. 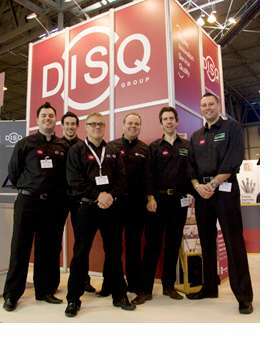 The DISQ team (pictured, left) was kept busy throughout the three-day event held at Birmingham’s NEC. DISQ display, innovation, service and quality is run by professional suppliers with a shared vision, a shared ethos, and a shared determination to be absolutely the best in the business. We, along with our fellow member companies, decided to invest in the event and always knew that DISQ’s fresh approach and service-oriented personality would shake up the marketplace, but not quite to the extent that it did. Under the DISQ banner Eve Products, Eurostand Display and Promotor Industries International are uniting to deliver an unrivalled portfolio of indoor and outdoor displays, promotional hardware and exhibition solutions through a common, service-led approach to customer care. As the collaboration develops further, customers across the UK will benefit from unrivalled experience, first class technical support and access to the largest product range in the industry from a family of suppliers dedicated to delivering complete satisfaction. We’re proud to announce that we are one of the founder members of DISQ a brand new initiative that sees us joining forces with specially-selected partners both to benefit our existing clients and significantly broaden the markets into which we are expanding with our new products. DISQ display, innovation, service and quality is a new, group run by professionals with a shared vision, a shared ethos, and a shared determination to be absolutely the best in the business; just like our Twist range. You’ll find us alongside our DISQ partners on stand J60 at this year’s Sign & Digital UK exhibition.